Ankara's support for ISIS and other jihadist groups became undeniable in January 2014 when Turkish prosecutors sent a team to search three trucks in the southern province of Adana. The Syria-bound trucks carried a cargo of more than fifty missiles and nearly forty crates loaded with ammunition. An ISIS jihadist later indicated that the Turkish government had delivered stocks of weapons and military hardware to the group's fighters in Syria. Turkey's Islamist government has had rational reasons to support discreetly its own Frankenstein monster: the Islamic State of Iraq and Syria (ISIS). The jihadists who have conquered large swathes of Syria and Iraq since the summer of 2014 may have the habit of beheading every infidel they catch, Muslim or non-Muslim. But they are merely the excessively savage next of kin to Turkish Islamists, who pursue similar political goals in Western-style suits and neckties instead of Arab gowns imitating the Prophet Muhammad's attire. Their kinship diverges over methodology rather than objectives. But there is also a pragmatic attachment built on a shared obsession with common enemies. The Shiites whom ISIS militants love to slaughter are privately viewed by Turkey's Sunni supremacists as heretics (therefore, infidels). Likewise, Ankara views Syria's Kurds as a major security threat. The Turkish government believed that investing in ISIS (and its brothers in arms such as Ahrar ash-Sham and an-Nusra Front) would facilitate the downfall of Syrian president Bashar Assad, Turkish president Recep Tayyip Erdoğan's friend-turned-nemesis. They miscalculated, and thus began Turkey's own Frankenstein story. Ankara's quiet support for any jihadist, ISIS or otherwise, has long been an open secret. 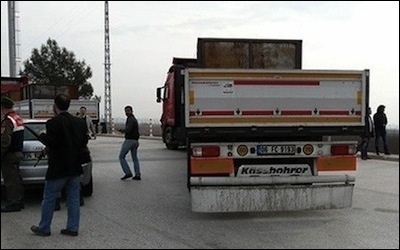 It became undeniable in January 2014 when Turkish prosecutors sent a team of gendarmerie officers to search three trucks in the southern province of Adana. The Syria-bound trucks, with a bizarre cargo of missiles, rockets, and ammunition in boxes marked in Cyrillic—were escorted by Turkish intelligence officers. A prosecutor arrested the men and seized the cargo, but then all hell broke loose. The governor rushed to the scene and declared that the trucks were moving on orders from then prime minister, now president Erdoğan. They were then handed back to Turkish intelligence. One of the drivers testified that the cargo had been loaded from a foreign airplane at Ankara's Esenboga Airport and that "we carried similar loads several times before." In the summer of 2014, a military prosecutor took charge of the legal proceedings and ruled that "this is a military affair." Shortly afterward a court ordered a total media blackout on the incident. Today, the law enforcement officers who searched the trucks stand trial on charges of "international espionage." But what was the destination of the cargo in Syria? The answer, once again, is an open secret. Two months after the seizure of the cargo, an audio recording was leaked to the social media by unknown sources. It contained full minutes of a top-secret meeting at the Turkish foreign ministry's premises of some of Turkey's most important men: then-foreign minister Ahmet Davutoğlu (now prime minister); his undersecretary Feridun Sinirlioğlu; chief intelligence officer Hakan Fidan; and deputy chief of the general staff, Gen. Yaşar Güler. The recording offered a realistic reading of Ankara's Syria policy. For instance, the Turkish bigwigs were heard saying that "an attack on Syria 'must be seen as an opportunity for us [Turks].'" The spymaster is heard saying that a false flag operation would be very easy, and he could "send a few men to Syria to attack Turkey." Fidan is also heard saying that "he had successfully sent two thousands trucks into Syria before." That solved the mystery of the trucks with the curious cargo two months earlier. A year later, further evidence of support for ISIS emerged when an ISIS jihadist indicated that the Turkish government had delivered stocks of weapons and military hardware to the group's fighters in Syria. Mehmet Askar, now being tried in a high criminal court in Turkey along with eleven other suspected ISIS fighters, revealed that a 2011 plan to transfer arms to ISIS and to an-Nusra Front, as well as to the more moderate Free Syrian Army, was hampered by the Syrian army's capture of a key border town. Askar's accomplice, Haisam Toubalijeh, who was involved in a weapons transfer thwarted in 2013 by Turkish forces, reassured him that contacts inside the Turkish state would help facilitate the movement of the cache, which included some one hundred NATO rifles. The secret was out. As the Arab upheavals spread across the region, then-foreign minister Davutoğlu hoped that a belt of Sunni Muslim Brotherhood-ruled regimes, subservient to an emerging Turkish empire, would proliferate in Syria, Egypt, Tunisia, Lebanon, and Libya. Therefore, Syria's Alawaite strongman, President Bashar Assad, had to go. In August 2012, Davutoğlu predicted that Assad's days in power numbered only "a few weeks." Assad's downfall was a priority for Ankara, so it began to cultivate both ideological and pragmatic ties with and support for a rich array of jihadist groups in Syria, from moderates to ISIS and its variants. These jihadists would ward off Shiite influence in Syria, fight and topple Assad, and rebuild the country according to Ankara's ideological and geostrategic preferences. 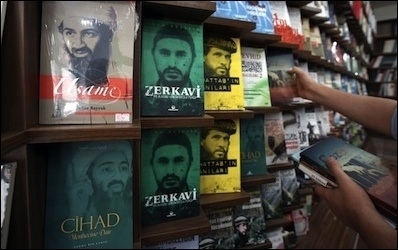 Books about Osama bin Laden and other Islamists are displayed at an Islamic bookstore in the Fatih district of Istanbul, October 13, 2014. Ideologically, the Erdoğan government is not alien to ISIS. In August 2014, Turkish polling service MetroPOLL found that "11.3 percent of Turks did not view ISIS as a terrorist organization." That figure may appear marginal, but it is actually horrifying. If a mere 11.3 percent of Turks think generously of ISIS, there are nearly nine million Turks sympathetic to jihadists. Even if a fraction of these sympathizers decided to join the jihad, then tens of thousands of new jihadists might be willing to fight in Iraq and Syria or inside Turkey if they thought that Ankara were allied with the West against their Salafist comrades. President Erdoğan's euphemism for ISIS is another indication of his semi-hidden sympathy for the jihadist cause. In October 2014, after a meeting in Paris with French president Francois Hollande, he criticized those "who try to portray ISIS as an Islamic organization. ... I am deliberately avoiding the use of the acronym ISIS," he told his audience. "I use the name 'Daesh' because these are terrorists." Shortly afterward, key Turkish government agencies including the military general staff and foreign ministry happily endorsed the new acronym. But, Erdoğan and his chieftains have been less than truthful with their Western counterparts for no other reason than that ISIS is a precise translation of the Arabic acronym "Daesh"—ad-Dawla al-Islamiya fi-l-Iraq wa-sh-Sham (the Islamic State of Iraq and Syria), and as such—includes the term "Islamic." As one European ambassador said at the time, "This is childish ... and in many ways illustrative of Erdoğan's [Islamic] supremacism that the words Islam and an evil concept cannot come together." Prime Minister Davutoğlu, architect of Turkey's foreign policy, has a similar narrative: "In our peripheral geography [and in Turkey, he then added], you cannot explain anything without the religion factor." Perhaps. But devising foreign policy based on the idea of explaining everything with the religion factor will not bring success. Religion as one's primary lens in policy-making is doomed. In June 2014, ISIS captured Mosul, Iraq, and raided the Turkish consulate compound, taking forty-six personnel hostage, including the consul-general. Here, Turkish foreign minister Ahmet Davutoğlu (right) kisses Turkish consul- general Oztürk Yilmaz on his return to Turkish soil after the hostages were freed. Davutoğlu claimed the release was the work of the country's intelligence agency although it is thought that cash switched hands. The Turkish government's support for ISIS and other jihadist groups in Syria and Iraq has not been cost-free. In June 2014, ISIS captured Mosul, Iraq's second largest city, and raided the Turkish consulate compound, taking forty-six personnel hostage, including the consul-general. In doing so, the organization apparently sought to prevent the Ankara government—deemed too pragmatic and "Western" by its standards—from betraying the Islamist cause. In reality, ISIS had seized not merely forty-six hostages but the entire nation, serving as a wakeup call for Ankara: If you deal with jihadists, you can one day become their victim. Turkey's 910-kilometer-long border with Syria had become an open highway for jihadists from around the world flocking to join ISIS. Border crossings and medical treatment for injured ISIS fighters that had been officially tolerated were upgraded to create a de facto hub that augmented ISIS's logistical base and firepower. Turkey's border with Syria had become an open highway for jihadists flocking to join ISIS. In the aftermath of the incident, Turkish intelligence heavily lobbied Sunni tribal leaders in both Iraq and Syria and managed to broker a deal with ISIS. Although the precise terms remain unknown, Ankara is believed to have freed several ISIS prisoners from Turkish jails and pledged not to attack ISIS strongholds directly in neighboring territories in return for the safe return of the hostages. Generous amounts of cash and other Turkish niceties were reportedly granted to ISIS, leading to the release of all hostages after 101 days of captivity. This, according to the Ankara government, "shows the level achieved by the great Turkey." In fact, the Erdoğan government has a love-hate relationship with the "more barbaric comrades of the same cause [da'wa]," whose violent conduct threatens to undermine its carefully contrived narrative of Islam's peaceful ways. But the family feud began to threaten Ankara and its interests in Syria. In October 2014, an ISIS video, titled "A Message to Erdoğan," warned that "Turkey shall be conquered with the shouts of Allahu Akbar." A narrator in the background was heard addressing the Turkish president: "Be prepared for the good news, for the time for your rule to end is getting close at the hands of the state of the caliphate [ISIS]." The narrator added: "Turkey has been spearheading the armies of 'Kufr' (infidelity) in fighting the mujahideen. It was the leader of the NATO forces in chasing the Taliban fighters. And today, the people of treachery refuse but to continue in their malicious ways although it is in a 'new and different look.'" threat because its followers believe that tombs are sinful and must be destroyed. The tomb was built in 1886, and in 1921, when France controlled Syria, a peace treaty granted Ankara sovereignty over the small plot of land containing the tomb. That land is Turkey's only sovereign land outside its own territory. Had the group made good on its threat and killed dozens of Turkish soldiers guarding the tomb, this would have greatly embarrassed the Turkish government. By way of preempting this eventuality, on February 21, 2015, the Turkish military sent 572 troops, 39 tanks, 57 armored vehicles, and 100 other vehicles to Syria to extract its besieged soldiers from the tomb. Shortly afterward, Davutoğlu and chief-of-staff Necdet Ozel proudly announced that the tomb had been relocated just a stone's throw away from the Turkish border. Privately, the Turkish government was resentful of ISIS, which until recently had not been viewed as a security threat. Following months of Western media accusations over Turkey's quiet support for ISIS, the Turkish leadership, in early 2015, decided to launch its own public diplomacy offensive. In January, the government announced that—for the first time—it had arrested a Turkish national on charges of joining ISIS. About a month later, on February 11, the Turkish General Staff announced that security forces had arrested thirteen foreign nationals and one Turkish citizen en route to joining ISIS. On March 12, Foreign Ministry spokesman Tanju Bilgiç said that Ankara was glad its Western allies were now sharing intelligence more freely (about potential ISIS fighters crossing Turkish territory). He claimed that the government had a list of 12,000 such names and had so far arrested and deported 1,100 people who would have otherwise joined ISIS. Commenting on the news to this author, a European Union ambassador said, "This is merely window dressing. We still have strong evidence that Turkey's counterterrorism officials do not wholeheartedly cooperate [with us] in our efforts to fight ISIS." 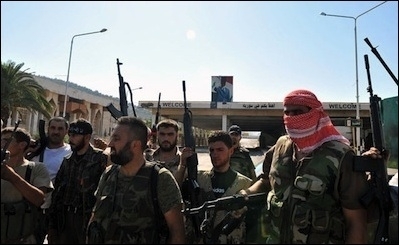 Syrian rebels pose after seizing control of the Bab al-Hawa crossing on Turkey's border, July 20, 2012. In February 2015, Ankara and Washington signed an agreement stipulating the initial training of some 2,000 Free Syrian Army fighters by a Turkish-U.S. team at a military base in Turkey, with an expansion of the program possible. However, the two countries remained divided over whether the priority target in Syria is Assad or ISIS. Meanwhile, after months of negotiations, in February 2015, Ankara and Washington signed an agreement detailing a train-and-equip program stipulating the initial training of some 2,000 Free Syrian Army (FSA) fighters by a Turkish-U.S. team at a military base in Turkey with the possible expansion of the program to 15,000 trainees or more depending on the progression of FSA operations. This agreement notwithstanding, the parties remained divided over both the program's strategic rationale, namely "who is the priority target in Syria: Assad (for the Turks); or ISIS (for the Americans)" and its operational details, notably Ankara's conviction (and Washington's skepticism) of the importance of a no-fly and safe zone for toppling the Assad regime. "We remain allies with a common view to Syria's future, but we have different priorities," a U.S. diplomat told this author. For months, the Western allies have pressured Turkey to close its porous border, which has allowed thousands of jihadists to cross into Syria to join the Islamic State ... and has enabled ISIS to smuggle in weapons andsmuggle out oil on which it relies for revenue. Although the Turkish government has taken some steps to make transit harder, it has been unwilling, or unable, to stem the flow, according to Tim Arango and Eric Schmitt's reporting in The [New York] Times. One smuggler said that while his job has become more difficult, sometimes the Turkish border guards look the other way. The Erdoğan government's Syria policy has been a fiasco. From the start, it was too sectarian and lacked coherence. It underestimated both the scope of Tehran's and Moscow's support for the Assad regime and the potential costs of supporting Islamist groups in the hope that they would solve Ankara's anti-Assad obsession. It was similarly based on the unrealistic hope of transforming radical groups into pragmatic Islamists subservient to Turkish interests merely on the basis of Sunni solidarity without calculating the major ideological differences between Turkish Islamists and jihadists. · Pretend to cooperate with Western allies with the aim of winning hearts and minds by cheating without ISIS noticing. Sunni solidarity against infidels including Shiites —without Iran noticing— so that ISIS's sleeper cells inside Turkey do not attack and embarrass the government before the June 2015 parliamentary elections. · Win Western support for Assad's downfall in return for reluctant and limited support for the West's fight against ISIS. · Challenge Russian interests in Syria without alienating Moscow, so as not to spoil the booming bilateral trade and energy deals. · Play the peace game with Turkey's restive Kurds and offer timid support to Kurdish troops fighting ISIS in Syria, but not too staunchly or publicly (but also not too reluctantly so as to prompt the Kurds to leave the negotiating table in Ankara). · Do not support the Kurds too much in case the peace talks collapse and rebel Kurds turn against Turkish targets. · Launch a charm offensive to look like an ally to all involved parties: the West, Kurds, ISIS, and various groups of Islamists at home and in the neighborhood. The Erdoğan government's Syria policy has underestimated the potential costs of supporting Islamist groups. into ISIS's activities inside Turkey. The next day, the motion was rejected by Erdoğan supporters' overwhelming majority in the Turkish parliament leading Gur to decry the vote as "a sign that the Turkish government still refrains from taking a clear position against ISIS." Ankara's support for ISIS (and various other jihadist groups) has been back and forth from stealth, to not-so-stealth, from open to temporarily suspended, curbed, suspended again, and rebooted, depending on what method the government felt it could use to hoodwink a suspicious Western audience and how much it thought it could lean on ISIS for the downfall of the Assad regime. Eventually ISIS has become a security threat to Ankara itself. Not embarrassed at all, the Turkish administration still invests in any radical group it thinks can help the Turks in toppling Assad and creating a Muslim Brotherhood-type regime in Syria. Burak Bekdil is an Ankara-based columnist for Hürriyet Daily News and a fellow of the Middle East Forum. He has also written for the U.S. weekly Defense News since 1997. Al-Monitor (Washington, D.C.), Jan. 15, 2015.
 International Business Times (New York), Mar. 27, 2014. The Jerusalem Post, Feb. 10, 2015. Haber 7 TV (Istanbul), Aug. 10, 2011. Breitbart News Network, July 30, 2014; BBC News (London), Sept. 1, 2014. Onedio (Ankara), Aug. 26, 2014. Yeni Akit (Istanbul), Oct. 31, 2014. Sabah (Istanbul), Jan. 7, 2015. Author interview, Ankara, Nov. 4, 2014. Hürriyet (Istanbul), Sept. 20, 2014. Today's Zaman (Istanbul), June 11, 2014. Daniel Pipes, "More on Turkish Support for ISIS," DanielPipes.org, June 18, 2014. Today's Zaman, Sept. 20, 2014. VHN Daily Blog, Mar. 26, 2015. Burak Bekdil, "How Turkish Media Embarrassed Goebbels," Hürriyet, Feb. 25, 2015. Bugün (Istanbul), Mar. 11, 2015. Al-Jazeera TV, Feb. 18, 2015. Defense News (Springfield, Va.), Feb. 18, 2015. Author interview, Ankara, Feb. 25, 2015. The New York Times, Mar. 14, 2015. Related Topics: Iraq, Syria, Turkey and Turks | Burak Bekdil | Summer 2015 MEQ receive the latest by email: subscribe to the free mef mailing list This text may be reposted or forwarded so long as it is presented as an integral whole with complete and accurate information provided about its author, date, place of publication, and original URL.